The world is a crazy place. Watch any news channel or Facebook feed and it’s clear these are tumultuous times. Change is never easy. Dismantling the old to make room for the new is disruptive and uncomfortable. Luckily, cake makes everything better! 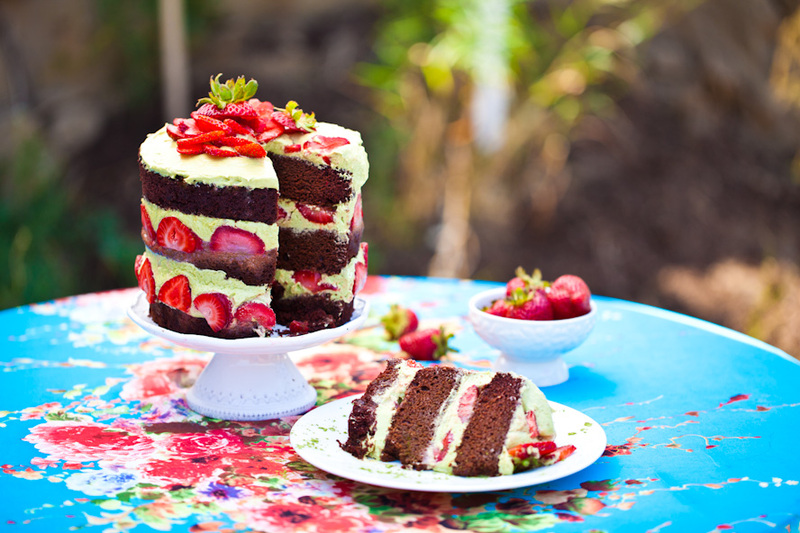 This Vegan Chocolate Matcha Cake has three layers of rich chocolate cake filled with matcha cream cheese frosting and fresh strawberries. For the assembly of the Vegan Chocolate Matcha Cake, you will need a 6″ spring form cake pan, 2 large sheets of acetate (plastic laminate), scotch tape, and plastic wrap. For a more detailed visual step by step, you can reference our post for Vegan Pumpkin Spice Layer Cake. Rich chocolate cake with melt-in-your-mouth flavor! Paired with matcha cream cheese frosting and fresh strawberries, every bite tastes like pure heaven. A springform pan and acetate sheets form a simple mold for the impressive naked layers. Preheat the oven to 350. In a small bowl, combine 1/4 cup of the coconut milk with 1/2 teaspoon vanilla. Set aside, this is your “milk soak.” In a large bowl, combine all dry ingredients and whisk together until even. In a separate bowl, combine all wet ingredients, whisking until even. Slowly stream the wet ingredients into the dry ingredients. Whisk until even, being careful not to over mix. The batter may still be a bit lumpy. Line a 9×13 baking pan with parchment paper and spray with cooking oil. Pour the batter into the pan and smooth out the top with a spatula. Bake for 30-35 minutes. Remove the cake from the oven and set aside to cool. You may place the cake in the freezer for 5-7 minutes to speed this up if you’re in a hurry. Once cooled, put a piece of parchment the counter. Invert the cake onto it and peel off the parchment. Use the cake ring from your spring form pan to stamp out 2 circles and 2 half circles from the cake. These are your top 2 cake layers. The remaining cake “scrap” will come together to make the bottom layer of the cake. Place the two sheets of acetate or laminate into the cake pan as shown. You are creating a tall mold to shape your cake in. Tape the sides of the sheets together to form your sturdy mold. Layer 1- The Bottom – Put the 2 half circles into the cake ring, and use cake scraps to fill in the center. Use the back of your hand to tamp the scraps together into a flat even layer. Dunk a pastry brush in the coconut milk soak and give the layer of cake a good, healthy bath of half of the soak. Use the back of a spoon to spread one-fifth of the frosting in an even layer over the cake. Place one-third of the strawberry slices evenly over the frosting. Use the back of your hand to anchor them in place. With the back of a spoon, spread a second fifth of the matcha cream cheese frosting as evenly as possible over the crumbs. Layer 2- The Middle – Set a cake round on top of the frosting, and repeat the process for layer 1 (if 1 of your 2 cake rounds is messier than the other, use it here in the middle and save the prettier one for the top). Layer 3 – The Top – Nestle the remaining cake round into the frosting. Cover the top of the cake with the remaining frosting. Give it volume and swirls, or smooth it out into a perfectly flat top. Decorate the top with the remaining strawberries. Cover the cake and transfer it to the freezer and freeze for a minimum of 12 hours to set the cake and filling. the cake will keep in the freezer for up to 2 weeks. In a large bowl or stand mixing bowl, combine the vegan cream cheese, vanilla, avocado, and vegan shortening. Cream together on med high for 1-2 minutes until smooth. In a separate bowl, whisk together the matcha and powdered sugar. Slowly sprinkle in the matcha sugar mix to the cream cheese blend while mixing on medium high. Cream the Matcha Cream Cheese Frosting together for another 2-3 minutes until it is light and fluffy. The frosting will keep in an airtight container in the fridge for up to 3 days. Did you love this Vegan Chocolate Matcha Cake and want to try more super easy GORGEOUS naked layer cakes? Not to worry, we love layer cakes too! In addition to our Vegan Chocolate Matcha Cake, check out our Vegan Red Velvet Cake or our Vegan Lemon Raspberry Layer Cake. If you enjoyed this Vegan Chocolate Matcha Cake recipe and want to save it for later, pin the photo below for easy reference! Don’t forget to tag us in your Instagram photos of your beautiful vegan cake creations using the tag #carrotsandflowers 🙂 It will make our day! And if you feel inspired, share this post so other plant-food loving people can make Vegan Chocolate Matcha cake too!